Do you want to become a more effective and engaging presenter? …Create lectures that keep your students' attention the whole time and increase the likelihood that they'll learn & remember the material. Or conference presentations that demonstrate your professionalism and skills, and set you apart from the sea of #DeathByPowerpoints out there? Or presentations are so engaging and convincing, that you’re more likely to encourage people to use the data for informed decision making or policy change? If you said yes, then you do not want to miss #StellarSlidesin5. #StellarSlidesin5 is the biggest FREE training event that I do and it's AWESOME. If you hear "big" and think "that's a lot of work" then you'd be wrong. KEEP. READING. Not convinced yet? No prob, corn cob. Here are 6 reasons you should attend #StellarSlidesin5. 1. It's going to be FUN. "ugh, my brain is dead. I can't do any more learning." "Thanks but no thanks, I don’t have time for another boring webinar." "Webinars are terrible and I won't watch them unless I absolutely HAVE to." And...I totally get that. Let me give some reassurance. Remember: I train people on how to create effective presentations...which means I need to practice what I preach. I spend A LOT of time on these slides and strive to make them fun, lighthearted, and engaging. Yes, I'll have a slide deck to share, because I want to show you what you can do with great slides. Ultimately, this is going to be informal, casual, and full of jokes/cute pics. These are informal brownbags, I do not hold back on the gifs or memes. 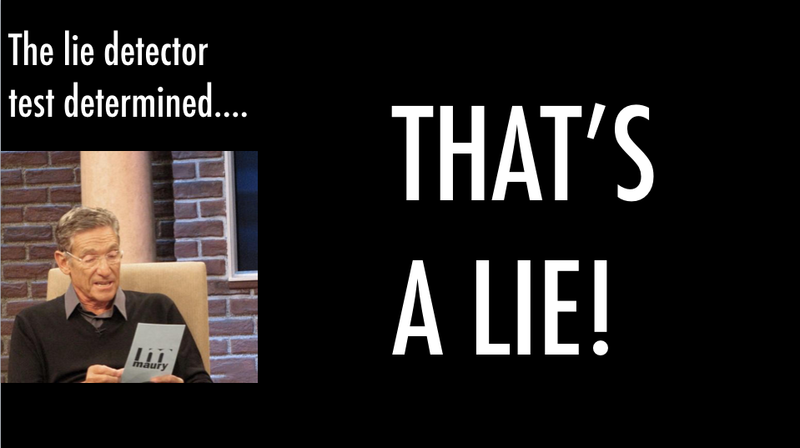 Still skeptical, because you've had such a bad experience with webinars? 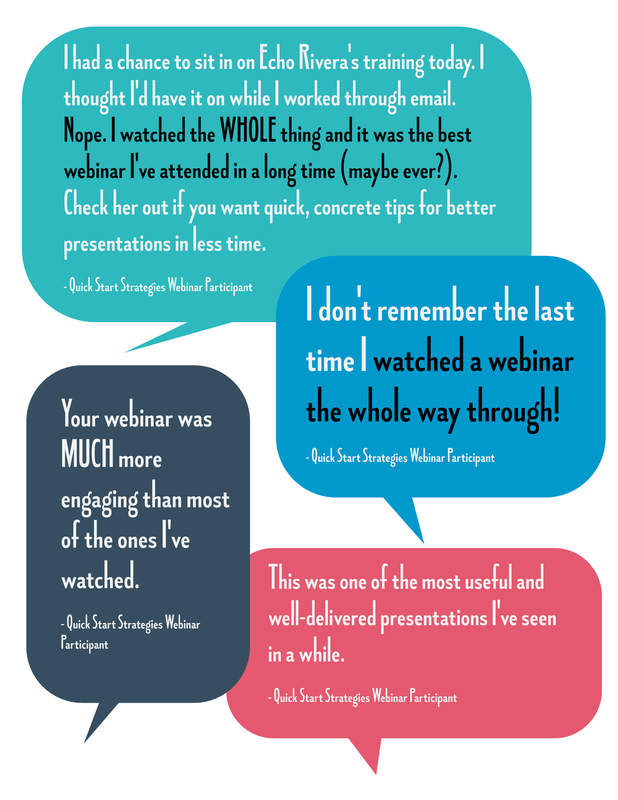 Here is what people JUST LIKE YOU have said about my webinars. 2. You get a workbook included with your registration! Not only do you get 5 days of video training, I also created a workbook to supplement your training. You get refreshers on what we covered in the videos, plus bonus activities for you to complete. If you’re not geeking out over a bonus workbook (weirdo), then no worries: it’s totally optional! 3. The videos are short (~30 min each)! I know you DON’T have a ton of time. That’s why each brownbag is only about 30 minutes long and you probably won’t even need to take notes. That means you can watch the brownbags while you chow down on your poke bowl. That’s more productive than scrolling through Facebook on your lunch break (and, in my opinion, more enjoyable). 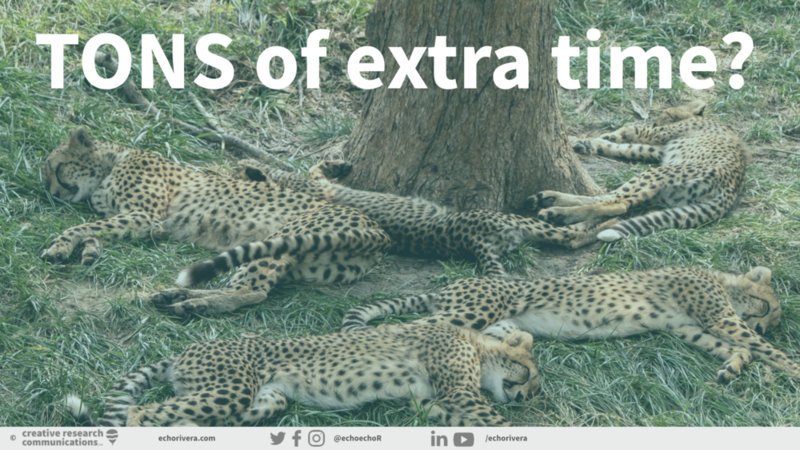 All of my resources are made for busy people, and the #1 thing I can do to help you fit these videos into your schedule is by offering replays. Well, keeping the videos short helps too. But being able to have full control over when you watch the videos is really helpful. If you register, you’ll get the links to each live brownbag, as well as access to all of the replays about 24-48 hours after the live delivery. Look. Let's be real. If you haven't taken formal training in effective presentation design or development then you need it. If you've just been using PowerPoint or Keynote for years, and/or had your advisor/instructor/colleagues tell you a few tips...then you need to take real training. All 5 days in #StellarSlidesin5 is provided at NO COST. Where else can you get that much helpful, actionable training for free? The answer is NOWHERE. If you're thinking: "Well if it's free, then it can't be that good." then that's wrong, too. I am able to provide this for free because, after seeing how AMAZING my free content is...my hope is that some folks who attend will want to take advantage of this momentum and sign up for Blast off to Stellar Slides. 7. You’ll get access to early bird pricing and bonus swag for my online course, Blast Off to Stellar Slides. Now, I’m going to be 100% upfront and honest with you. #StellarSlidesin5 is the presentation party I host before opening enrollment into my signature course, Blast Off to Stellar Slides. On Day 5, doors to BOSS open and there will be special early bird price AND bonus swag for the first few students. If, after taking #StellarSlidesin5 you decide that you like my training style and that you want to keep going and learn the entire framework, cool! BOSS will be open for enrollment if that’s the case. If not, that’s cool too! This is a no pressure situation here. At the very least, you got to see an example of how to give a good presentation, which you can use for inspiration in your next talk or lecture.